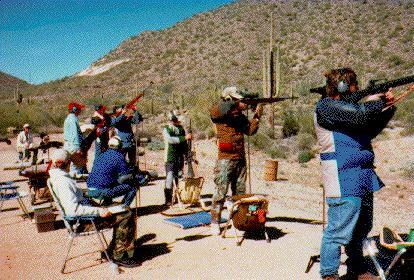 This is a typical Match at Rio Salado Sportsman's club, Mesa AZ. 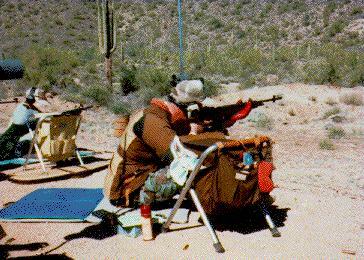 Here is a short description I wrote a coupla years ago, it pertains specifically to the Ojai Valley Gun Club's 1st Sunday of every month match, but is applicable to any National Match Course, or Service Rifle, or Highpower Rifle Match. Here's another write up from me, and here's one from Dave Gowan describing the reduced match at smaller clubs. Welcome to our National Match Competition. Since you're reading this, you're probably new to this game. Don't worry about your score, it does not matter. 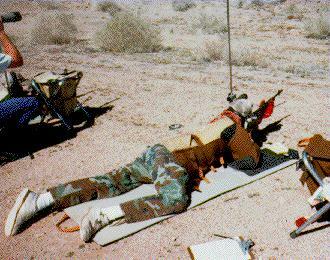 Just handle the rifle in a 100% safe manner, follow the range officer's commands and you'll be fine. For obvious reasons, if you violate a safety rule, you will be removed from the range. 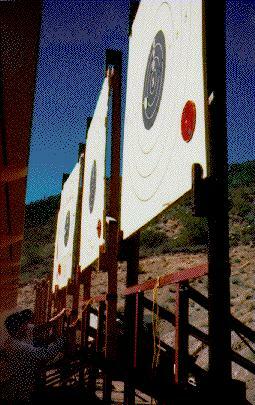 The other competitors will not look down upon you if you have a lousy score, but two things that will annoy them are: shooting the wrong target and doing a poor or slow job scoring their targets. 200 yards, 10 shots (plus 2 sighters) slow fire, standing, 12 minutes. 200 yards, 10 shots, rapid fire sitting, 60 seconds. 300 yards, 10 shots (after 2 slow fire shots, 2 minutes) rapid fire, prone, 70 seconds. 600 yards, 20 shots, (plus 2 sighters) slow fire, prone, 22 minutes. In the slow fire stages (including all sighters) load one shot at a time! and the target will be marked with value and hole location (see the target for value marker locations). Use the sighter shots to see where the bullets are hitting and then adjust the sight settings to hit in the center. On the M1, the left knob is elevation, the right is wind. One click is 1 inch per hundred yards: 2" at 200, 3" at 300 and 6" at 600. (match rifles and AR-15 have different click amounts). Assuming you are hitting somewhere near the center of the target, from 200 to 300, move the rear sight up about 3 clicks, from 300 to 600, 11 more, that should be close. After every stage, count the clicks down to the bottom and write that number down for next time. Some shooters find it helpful to write down where each shot is hitting and other info, use the attached sheets. At OVGC, shooters record their own score cards, list the value of each shot as it occurs, add up the total and hand your card in after the match. 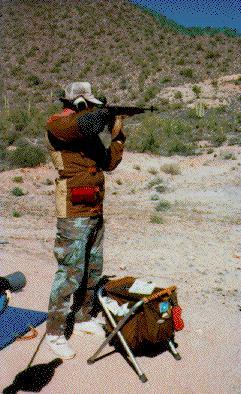 Feel free to ask for help from any of the experienced shooters, and welcome to our sport. We shoot the first Sunday of every month, we expect to see you! last modified by Bill Poole on 4-Jan-00, ©. Back to the NMC page.